There’s been a lot of debate over President Obama’s feelings about the job he holds. Some theorize he really doesn’t like being president while others think he’s having the time of his life. I tend to lean toward the latter as it appears the head of the executive branch is taking every opportunity he can to have a good laugh in private. There have been a number of odd little occurrences. Giving Britain back a bust of Churchill; bowing to the Saudi King; sending Netanyahu and the Dali Lama out the back way; giving Queen Elizabeth II an iPod full of his speeches and audio books; and I’m sure a few other events I’m forgetting. Now just the other day the president decides, hey, let’s celebrate Hanukkah early and instead of lighting one candle a day per tradition, let’s just light them all now and then party down! I’m not saying Obama doesn’t like the Jews, but I’m not not saying it either. But the pièce de résistance is something caught by The Blaze and brought to my attention by Twitter buddy @Robert23Hersey. Obama gave a rather anti-capitalist speech this past week in a city called Osawatomie, Kansas. Ever heard of it? I hadn’t, and it’s rare that the president makes a speech in a city I haven’t heard of. It can happen. You research demographics and maybe say this would be a good place to get some exposure leading up to 2012. Who knows, maybe. That’s right ladies and germs, “Osawatomie” was the name of the Weather Underground’s publication. Folks, we’re a long way past laughing these things off as coincidences. Obama is have a laugh, and he’s laughing at us. Pajamas Media has an editorial reply to Bill Ayers recent piece in the New York Times that the Times wouldn’t print. 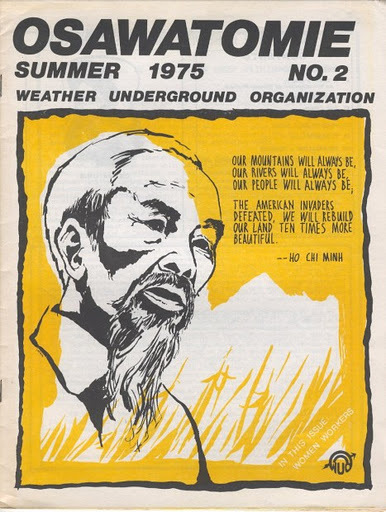 It’s by Larry Grathwohl, an FBI mole in the Weather Underground in the 1960s who saw it all. Not surprisingly, the New York Times has given Bill Ayers plenty of space to lie about his past. Who cares, right? Obama won, it’s over. Well, if you want to understand where we are and where we’re going as a country, you need to understand this man. Don Surber puts it in perspective. Now that Obama has been elected, his friends can roam around a little more freely. First up is domestic terrorist Bill Ayers who, with the help of The New Yorker is picking up where he left off on September 11, 2001. Ron Radosh has the scoop. I asked, “well what is going to happen to those people we can’t reeducate, that are diehard capitalists?” and the reply was that they’d have to be eliminated. And when I pursued this further, they estimated they would have to eliminate 25 million people in these reeducation centers. Andy McCarthy has a writeup in the National Review on Weather Underground member and Obama BFF Bill Ayers. It’s essential reading for anyone who’s been following this story. Why Don’t The Democrats Get It? I guess not being a child of the 60’s I’ll just never understand how a group of youths could consider bombing the Pentagon or Capitol, cheering on Charles Manson or killing cops, then 40 years later wondering why people look at them funny. Obama and the Democrats don’t seem to think that Bill Ayers and his comrades are a problem and that by bringing it up, McCain and the GOP are hurting themselves. Really? I’m no pollster, but I would bet the farm that a majority of Americans find the Weather Underground, shall we say, not on the level.